Based on the general objectives of Turkish National Education, the art curriculum in secondary education has been restructured in order to train individuals to be modern, rational, creative, devoted to national and historical values, and with aesthetic awareness. The works in curriculum development in education and the contemporary approaches to curriculum are also parallel with art education. The works that intend to improve quality in education involve analyzing the existing curriculums with the aim of restructuring those curriculums. In this context, the present work aims to justify changing the word “Painting” in the name of the secondary (high school) art curriculum and to highlight the functionality of this change. The explanation of this radical change in the curriculum based on the opinions of the people who experience the change directly reveals the importance of the present work. The present work also uncovers how the people experiencing these changes explain them at planning, process of teaching and assessment phases on the basis of three basic learning domains: historical environment and museum awareness, the culture of visual arts and constructing forms in visual arts. In the present work, the study group was determined with the criterion of at least 10 year-teaching experience and semi-structured interviews, which were arranged to be held sequentially, were conducted for in-depth data collection. In the scope of qualitative method, the data gathered based on the phenomenological design have been explained by thematic analysis. The results that have been obtained are presented together with suggestions. Ayaydın, A., Vural, Ü. D., Tuna, S. & Yılmaz, G. M. (2009). Sanat Eğitimi ve Görsel Sanatlar Öğretimi. (Editors: Ali Osman Alakuş, Levent Mercin). Ankara: Pegem Publishing. Bulut, İ. (2008). Yeni İlköğretim Programlarında Öngörülen Öğrenci Merkezli Uygulamalara İlişkin Öğretmen Görüşleri (Diyarbakır İli Örneği). Kuram ve Uygulamada Eğitim Yönetimi, 14(4), 521-546. Demirel, Ö. (2005). Kuramdan Uygulamaya Eğitimde Program Geliştirme. Ankara: Pegem Publishing. 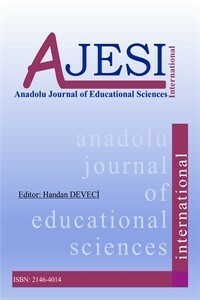 Güler, A., Halıcıoğlu, M. H. & Taşğın, S. (2013). Sosyal Bilimlerde Nitel Araştırma Yöntemleri. Ankara: Seçkin Publishing. Glesne, C. (2012). Nitel Araştırmaya Giriş (Translating editor: Ali Ersoy, Pelin Yalçınoğlu). (Original: 2011, 4th Edition). Ankara: Anı Publishing. Kalem, S. & Fer, S. (2003), Aktif Öğrenme Modeliyle Oluşturulan Öğrenme Ortamının Öğrenme, Öğretme ve İletişim Sürecine Etkisi, Educational Sciences Theory & Practise, 3 (2), 433-461. Miles, M. B. & Huberman, A. M. (1994). An expanded sourcebook qualitative data analysis. (2nd Edition). California: Sage Pablications, Inc.
M.E.B. (2009). Ortaöğretim 9, 10, 11 ve 12. Sınıflar Görsel Sanatlar (Resim) Dersi Öğretim Programı. Ankara. San, İ. (2010). Sanat Eğitimi Kuramları. Ankara: Ütopya Publishing. Yıldırım, A. & Şimşek, H. (2008). Nitel Araştırma Yöntemleri. Ankara: Seçkin Publishing.